A superb quality, solid English oak, arts and crafts wardrobe; featuring a beautiful out swept cornice. This leads down to two highly unusual beaten brass panels depicting palm trees. These flank a large single door with full length mirror which opens to reveal internal hanging rail and single shelf. The wardrobe is in outstanding condition for its age; circa 1900. 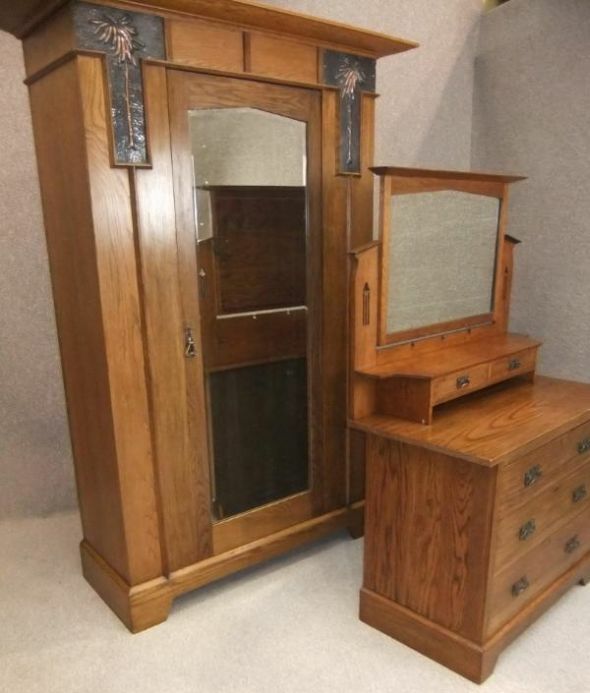 This arts and crafts wardrobe is accompanied by a matching solid oak dressing table, with numerous drawers and large mirror to top. Both items are in excellent condition, and are still fitted with all of their original copper handles. An ideal opportunity to purchase some classic English furniture for any period property.